There are soups for every season. This is a soup for winter. We are in the midst of Israeli winter at its most intense. It rained for three days straight, and oh, what rain! Some places even had a bit of snow. Fine, laugh. I know it’s not exactly winter in Siberia, but rain manages to paralyze the country every time. Yesterday the rain flooded one of the country’s most central highways, causing traffic jams that lasted for hours and leading the police to recommend against even attempting to enter Tel Aviv. As for those of us already in the city? I probably should have stayed home for the third day in a row, but I didn’t, and a short trip across town — a 5-10 minute drive in normal weather — turned to a 40-minute opportunity to bond with the cabby. On the bright side, we were seated in a cab while the rain was falling sideways. Though as my husband points out, if it’s going sideways, it isn’t really falling now, is it? In one way, this soup is strikingly similar to another tomato-wheat soup I posted — chewy bits of wheat amid a tomato base. 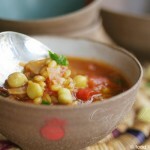 But that soup — made of freshly harvested green wheat and fresh chickpeas, is a soup for spring. 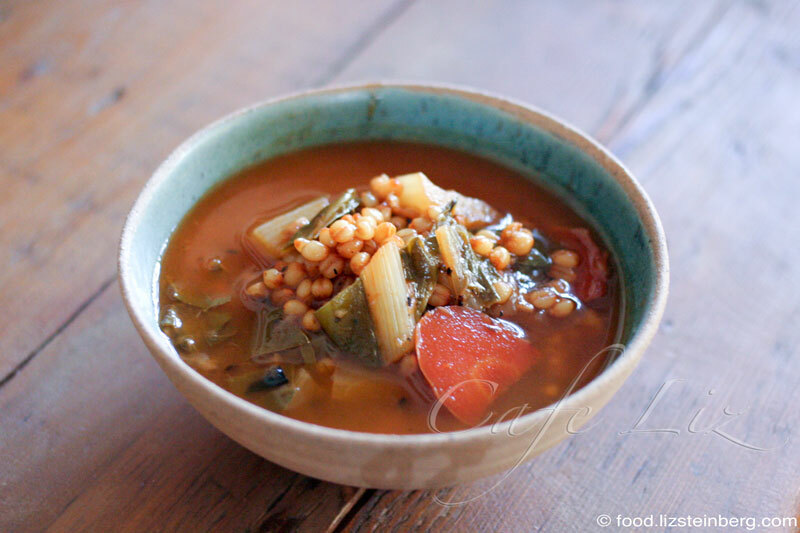 This is a soup for winter — hardened wheat berries harvested long ago and dried for storage, and sturdy mangold leaves. The fresh tomatoes have been replaced with tomato paste — a product I’ve been trying to avoid lately, though not at all cost. Different shades of soup, if you will. Unhulled wheat berries are tougher and chewier than hulled wheat berries. If you use hulled wheat, the soup will likely be ready within an hour; with unhulled wheat, it will take closer to two hours. Put some oil in a thick-bottomed pot on a medium flame. Add onions, and let cook for a minute or two until translucent. Add garlic, let cook for another minute, then add tomato paste and carrots. Let that heat up, too. Add the wheat, salt, pepper, loomi lemon, sugar, and 1.5 to 2 liters (quarts) of water to the pot, and bring to a boil. Cover and cook on a low flame until the wheat is soft but still al dente — this will take 40 minutes to 1 hour for hulled wheat, and as much as 2 hours for unhulled wheat. Once the wheat is nearly cooked, add the mangold and simmer until cooked — another 10 minutes or so. 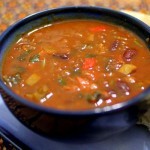 2 Responses to "Wintry mangold-wheat soup"
cold and snowy and rainy here in new england …. had to look up mangold …. beet greens? 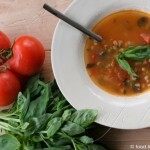 its the season for this soup here and i intend to make it! 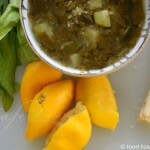 I think mangold is also known as Swiss chard, not beet greens. But beet greens would probably work too. As would something like kale or collard greens, if you’re in the U.S.